Do you realize your homes central heating and air conditioning system operates approximately 3,300 hours every year? To put this “run time” in perspective, a car driven for the same 3,300 hours at 65 miles per hour would travel 214,500 miles. No one would consider such a journey without arranging for oil changes, lubrication, and routine tune-ups along the way to assure the efficiency, safety and reliability of the vehicle. Your homes central heating and air conditioning system serves you many more hours than your car, and like your car, it too needs routine tune-ups to operate in an efficient, safe, and reliable manner. Regular central heating and air conditioning maintenance is the best way to ensure trouble-free operation and peak performance. It can help to avoid a system failure in severe hot or cold weather when you need it most, and it can also keep your energy bill from getting out of control. Dirt and neglect are the top causes of central heating and cooling system inefficiency and failure. To prevent problems, stay on a regular maintenance schedule. Let us extend your central heating and air conditioners life span, and ensure your family has a healthy and safe home environment. Your maintenance visit includes one 1″ disposable air filter per system. There are additional charges for aftermarket media type air filters, Electronic air cleaners, and CleanEffects™ air filtration systems. Your system will likely be running another 3,300 hours this year. Call us today at 909-398-1208 to have your system brought up to maximum operating standards. Not only is it the Law, but it could save someone’s life! A carbon monoxide alarm can be an invaluable investment for your home. This alarm will monitor the levels of carbon monoxide produced by the furnace and certain other appliances within your home, and signal if there is a problem. California law requires every home to install one on every story of your home, be sure to ask us during routine maintenance for details. One of our alert technicians caught this dangerous condition. Novell Custom Heating and Air Conditioning Company removed this cracked heat exchanger from a furnace that had never been properly maintained. When Should I Perform Seasonal Maintenance? We recommend having your air conditioning system serviced in late Spring when temperatures reach the mid 70’s. During the off-season, dirt, leaves and other debris can often accumulate around the condenser and inside the fan area. Running your air conditioning without the manufacturer’s recommended service during the equipment warranty period can void the warranty. 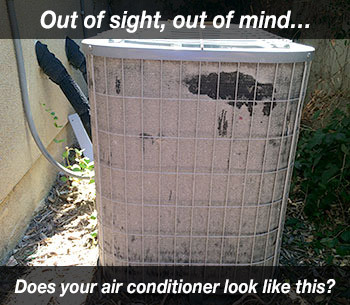 Please call us today at 909-398-1208 to have your system checked before summer use. A furnace requires periodic maintenance to ensure safety, maximize efficiency, and help minimize heating costs. If your equipment is new, keep in mind that warranties only cover certain functional parts for a specified length of time. 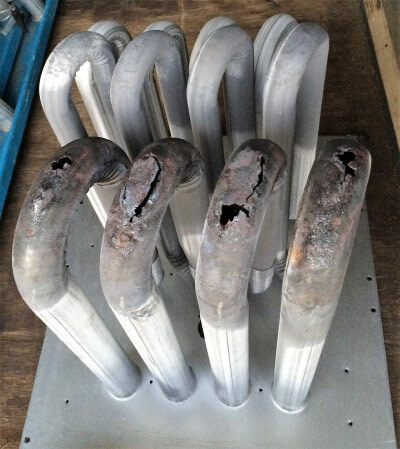 Failure to maintain your system per the manufacturer’s specifications may void the warranty. We recommend having your furnace serviced in early Fall, prior to the onset of colder Winter weather. During the off-season dust, spider webs, and debris can accumulate inside the blower compartment, and around the furnace burners. Operating your furnace without cleaning and inspecting the furnace burners and combustion venting could be unsafe for your family. Your Furnace may look fine, but is it really? Please call us today at 909-398-1208 to have your system thoroughly inspected for safety and efficiency prior to use. How often do I need to clean/change my air filter? For optimal air flow, it is best to check your air filter monthly and change as needed. In most homes the air filter will likely need replacing every 3-6 months. Keep in mind when your system and fan are running it is filtering and circulating your indoor air. Things like dust, pet hair, carpet fiber, and foot traffic affect how much filtration is needed. Some homes require more air filter changes per year than others. Regular cleaning/changing of your air filter will ensure the best filtration, increase the life span of the system, increase efficiency and give you peace of mind that you’re breathing easier. How do I clean my CleanEffects™ Air Cleaner? To clean your CleanEffects™ simply remove your filter and then rinse or vacuum it. If you rinse the collection cells, allow them to dry thoroughly before replacing them.